The article appears online, and in the latest issue of Billboard. 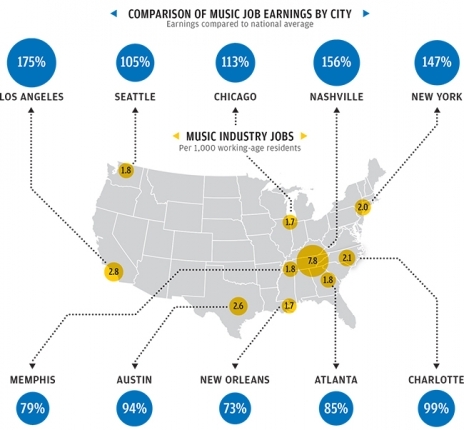 Turns out we have a higher concentration of music industry jobs than New Orleans, Atlanta, New York, and Chicago. And pay is only 1% below average. In terms of concentration of music industry jobs, Nashville is tops with 7.8 per 1,000 residents, according to EMSI data in the report. Los Angeles is a distant second with 2.8. Austin is third with 2.6. At 2.0, New York actually falls beneath the 2.1 of Charlotte, N.C. Via Michael Lowrey at The Meck Deck.